Home Page Mock Up Prior to creating the website, the first step is to create a "mock up" of the home page. This allows the customer to review and approve the design. Working Home Page Once the mock up is approved, a working home web page is created. This is usually the most difficult step in the web design process. Secondary Page Template After the home page is functioning, a template is created for the remaining pages. These pages usually, but not always, have the same general look and layout. Content The next step, which is the most time-consuming, is to add the content to each page. Content includes text, graphics, search engine optimization and custom programming. 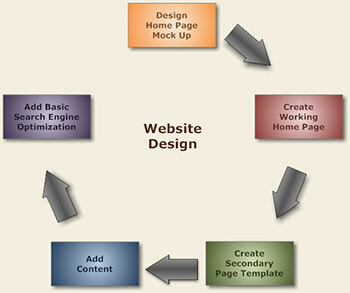 Search Engine Optimization Each page receives basic search engine optimization. Additionally, HTML and XML site maps and a robots.txt file are added. Oongawa Design is a web design and development company located in Indianapolis, Indiana. © 1998-2016 Oongawa Design, Inc.